The Islamic terrorist attack in London represents the future. This is what happens when a nation allows unlimited immigration and Muslim extremism to take root. Multicultural Britain is no match for radical Islam. Like a Trojan horse, the invading enemy has entered within. On Saturday night, Islamists rampaged at London Bridge and Borough Market. Their weapons were a van and knives. They slaughtered 7 civilians and injured nearly 50, stabbing people’s necks, chests and throats. The attack in London followed the suicide bombing in Manchester, which killed 22 people and wounded over 100. In three months, Britain has suffered three terrorist atrocities — all of them the work of murderous Islamists. In fact, the British security services now admit there are over 23,000 potential Jihadists in the country. This is an Islamic army almost equivalent in size to the ISIS force in Syria. Moreover, polls show that over a third of British Muslims sympathize with the terrorists’ goals. Over 50 percent of Britain’s Muslims want to impose Sharia law. While the native population’s birthrate is declining, the Muslim community is swelling. The most popular name given to newborns in England is not John or Jennifer, but Mohammad. London’s Muslim population is over 1.3 million and growing. 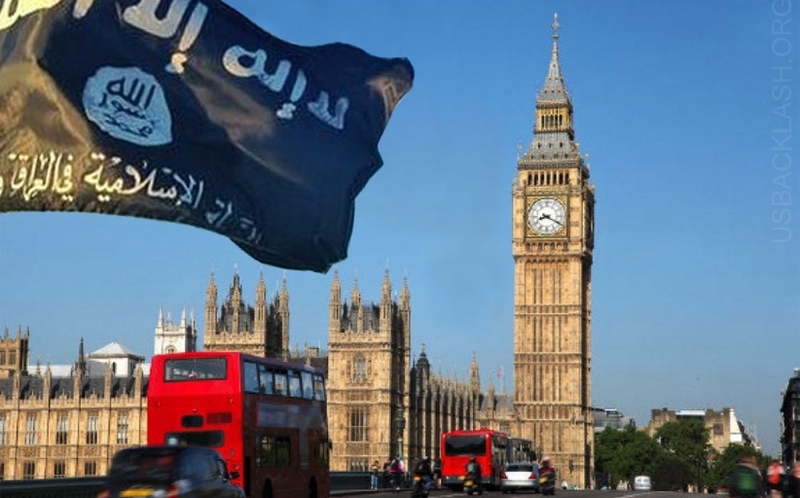 The writing is on the wall: England’s capital has been transformed into Londonistan. Hence, it’s no surprise London’s Muslim Mayor Sadiq Khan has repeatedly said that terrorism is the price Europeans must pay for living in a big, modern city. Khan is part of the problem. Instead of combating radical Islam, he is openly encouraging its appeasement. Khan wants to allow even greater numbers of Muslim immigrants into London and the United Kingdom. The reason is obvious: The more Islamic Britain becomes, the more powerful Muslim politicians, such as Khan become. This is why he champions open borders, globalism and multiculturalism. Under the ideology of “cultural diversity,” Islamic civilization is able to relentlessly expand. Khan is part of a Muslim fifth column. His goal is Britain’s national — and civilizational — suicide, seeking to replace the Union Jack with the Crescent of Islam. Yet, Britain’s liberal elites are ultimately to blame. For decades, they actively promoted mass Third World immigration, especially from the Muslim world. The authorities have turned a blind eye to increasing radicalization in schools, prisons and mosques. It has become so bad that one of the London Jihadists last year took part in a TV documentary, in which he called for Holy War against the West, and law enforcement did nothing. Political Correctness has paralyzed British society. The result is terrorism, mayhem and mass murder. The sad truth is that the liberal West cannot stand up to Islamic extremism. With their fanatical embrace of “pluralism” and moral equivalence, liberals refuse to acknowledge the seminal reality about militant Islam: It is not a religion, but a death cult. It is not a “religion of peace.” It is a socio-political ideology based on cultural supremacy, violence and conquest. In every country where Muslims are the majority or a significant minority, extremists emerge who engage in Holy War and persecution against infidels. This is true across the Middle East, North Africa, Pakistan, Afghanistan, Indonesia, the southern Philippines, China, India and now Western Europe and America. In short, the rise of Islam is never accompanied with peace and social tranquility. This is why liberalism’s experiment in multiculturalism is doomed to fail; Islamic civilization cannot peacefully coexist with the West. The only question is: How many must die at the altar of Political Correctness? When Trump took to Twitter after the London massacre to renew his call for a ban, CNN host Reza Aslan, an Iranian Muslim, tweeted that the president is “a piece of s**t.” Leftist media elites excoriated Trump for “politicizing” the terrorist attack. In other words, the mortal threat to democracy is not a rampaging army of suicidal Islamists, but a president who advocates basic anti-terrorism measures. This is treason bordering on madness. Britain, along with much of Europe, is finished. Its moral decay and civilizational decline is too far along. Its spiritual vacuum is being filled by radical Islam. The Europeans — with the exception of Poland, Hungary and Russia — do not have the will or the ability to confront the gathering storm. Trump is desperately trying to prevent the Islamist cancer from metastasizing here. If he fails, the United States will become another United Kingdom.